A classic and versatile Cornet. The 800S Eterna offers a complete range of sounds suitable for concert, jazz, or brass bands. 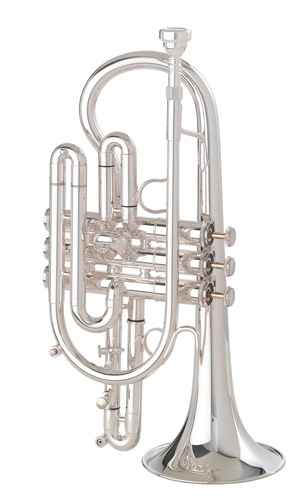 USA made, the Getzen Company proudly employs specialist brass technicians and master craftsmen to ensure only the finest instruments bear the Getzen name. Top quality and reliable valve action. Large Bore .464 nickel silver slides, gold brass mouthpipe, 4.75 Yellow Brass Bell, first slide ring, third slide ring, Bright silver plate.